Move your body, chant, and meditate in two Kundalini Yoga classes a day. Nourish yourself with 3 organic meals a day. Time to breathe and release in the rainforest, the ocean, the jacuzzi, the local markets and in time spent with inspiring humans! Vortexes are the intersections of natural electromagnetic earth energy. They are potent, swirling centers of energy that are conductive to healing, meditation, self exploration and awakening. Upon visiting, you experience a domino effect of removal of obstacles, uninhibited flow of blessings, and the release of limiting perceptions. Likewise, we each have a personal electromagnetic field which has the same capacity for this healing and ease. And when we are aware of it, we can learn how to clarify and align for its activation, at any time and place. Kundalini Yoga is a technology that allows us to align with Source energy, which is our natural state, and learn to get to know ourselves and our patterns so we may know how to come back to center. We are going to the physical Vortex of Samasati, Costa Rica to practice the technology and teachings of Kundalini Yoga, with the intention of aligning with the unlimited potential of our own personal Vortex. In this extremely supportive environment, we will have deep and sacred experiences and lessons that will inform every day for the rest of our lives. Come experience yourself like never before! Costa Rica is the land of “Pura Vida” which means “pure life” a life that offers us the chance to slow down and practice more mindfulness and presence to encourage healing and true happiness. 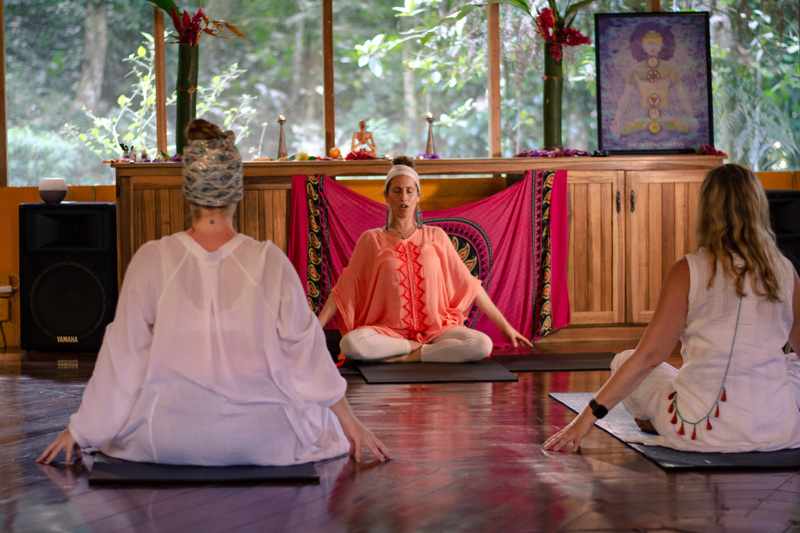 Kundalini Yoga in the Rain forest is a very powerful experience. I am inviting you to allow yourself to purge in a sacred and safe way, what you have held onto for so long. This is the space to release from your mind and body, all imprints of traumas, guilts, and fears, from this lifetime or lifetimes past. Sometimes we don’t have to know what is moving, we just have to say yes to allowing it to move. “The Eighth Chakra is the aura. The aura combines the effects of all the other chakras. To experience this, imagine yourself rising high above your physical body. As you look down at the radiant light of the aura, it appears to be an oval or a circle of light. This chakra is often referred to as the circumvent force, the strength of the energy shell that surrounds all the other chakras. It, too, is a chakra, a circle, a vortex of energy, a place to focus the flows of universal energy. When the circumvent field is strong, negative influences are automatically filtered. When it is weak, you seem vulnerable to everything that passes by or through you. The circumvent force is sort of an aura—a circle around the body—which is a most powerful force that protects you from all negative forces. Those people who are humble, affectionate, and serviceful, and who breathe the divine force, make their mind concentrate on the breath, and pray to the universal spirit by tuning into it—their own magnetic field becomes strong. Electric power gets charged because of their life force, and their circumvent force becomes so strong that it can keep away all negative forces and they can change the destiny of the others.